We are passionate about the conservation of heritage art! We continually research into methods, techniques, styles and materials. Highly skilled in the conservation, restoration and reconstruction of heritage artwork and designs, our artistic conservation-restoration service includes the cleaning, repair, conservation and reconstruction of art and designs including picture frames and furniture. We have the skills and expertise to sensitively clean art and to recreate artwork or decorative design even if the original is in very poor condition using techniques of micro analysis or spectroscopy, or with the use of mechanical methods. As such, Lancaster Painters Australia Pty Ltd are committed to the conservation-restoration of heritage art for future generations to enjoy. Following the Burra Charter, Lancaster Painters Australia provide historical and traditional heritage painting methods that are reproduced using the same paint methods and materials employed after which painting methods began to dominate the industry. Our work is based on exhaustive continuous research into methods, techniques, styles and materials. Every piece of art is individually hand painted by highly skilled artisans with no compromise in quality, historical accuracy or consistency. Heritage art conservation-restoration of the heritage painting (above) included the sensitive cleaning of the artwork and the reconstruction work of the frame including the application of 24 karat gold leaf. The dining room ceiling of “Auld Reekie“, a Queen Anne National Trust House, was water damaged by a severe storm in Melbourne. Lancaster Painters Australia won the contract to clean, repair and reconstruct the heritage painting, decorating and artistic work of the ceiling, cornices, air vents and wallpapered walls. Works included paint scrapings and analysis, sensitive cleaning and reconstruction of all paintwork and decorative work including stencils. Featured above is the cleaned and reconstructed artistic centrepiece of the dining room ceiling. See below for photos of the water damaged centrepiece and progression of the cleaning and reconstruction work applied by heritage artist Gary Lancaster. 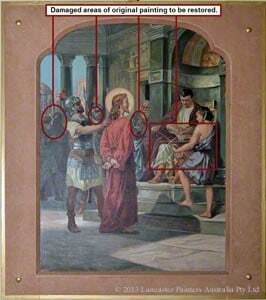 Featured above: is a closeup of the damage caused by vandals to the “Jesus is Condemned to Death” Station of the Cross artwork. Heritage restoration, reconstruction and beautification work to the interior of the “Church of the Sacred Heart” in Semaphore included the sensitive cleaning of and artistic repair work to the “Stations of the Cross”. Most of the stations required repair work. Featured left: Before and after photos of the artistic conservation and reconstruction work to the “Jesus is Condemned to Death” Station of the Cross. The first photo is the original artwork that had been vandalised. We have highlighted the areas that were in need of repair. The second photo is of the finished work, after it had been sensitively cleaned and artistically rejuvenated by heritage artist Gary Lancaster.